With the development of High Temperature Air Combustion Techonolog,honeycomb ceramic has been widely used in filelds of smeltingmetallurgypetrochemicalelectric powerboilerand so on. Our company has researched and developed a series of honeycomb ceramics for heat storage according to the different features of industrial furnaces. 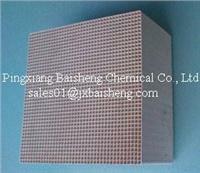 Our own research and developed honeycomb ceramic has characteristics: large surface arealow pressurestrong heat storagelow average linear expansionstrong corrosion resistance against acid and alkali and so on..
Technical performance of our products are superior to domestic ones and get the level of same ones abroad. Other shapes, specification and material are available.